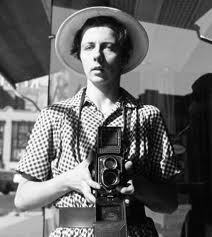 Yesterday was Vivian Maier day for the blog sisters. For the full story, go to this Chicagomag.com article, but the nutshell version is that Vivian Maier was a French nanny professionally and a street photographer avocationally. But she wasn't just an average hobbyist. She shot thousands of scenes on the Chicago streets over several decades and may be one of the best street photographers ever. It's an interesting story and there's a great video available at Writing without Paper. But, for me, the story becomes fascinating, if not actually karmic, when John Maloof, a 26-year-old realtor happens to buy boxes of her stuff at an unclaimed storage auction. In the video, he comments that he doesn't know why "someone like me" found this treasure, inferring that he doesn't know enough about photography or how to handle a collection like this as he should. But, perhaps John was the perfect person. Like someone who has had a baby dropped off on his doorstep, he has carefully tended and nourished it. He is carefully scanning negatives, developing hundreds of rolls of film still in the containers and connecting Vivian to the art world she never engaged with while she was alive. John Maloof's story can be seen as a metaphor. While following his passion (writing a book about his Chicago neighborhood), he finds a mysterious object. He can walk away from it ... or he can explore it further. He pays the price and takes it home and as he unravels it, he finds ... not what he was looking for ... but something else shiny and fascinating. At each moment he can put it back in the attic and return to normal life. But he stays, digging deeper and deeper until he discovers the real treasure of a hidden life and, in the process, even more about himself. Sometimes we just have to take what life hands us and discover what gold it contains. I will watch with great interest as this story unfolds, and, fortunately for me, I'll be in Chicago in time to see Vivian's show at the Chicago Cultural Center (show dates: Jan 8 through Apr 3). And, for any of you interested in investing in the movie, John and his partners are raising funds for a film about Vivian. Just go to http://kickstarter.com and search under Vivian Maier. Great post, Joyceann. Thank you for the acknowledgment.